We all know how powerful live video can be. But live video is a tool, not a solution. Now that you have the tool, you need to know how to use it well to turn it into more impact and sales for your business. In this session, you’ll learn the 3 mistakes that make your audience keep scrolling past your lives, why “just start” is a hoax, and how you can start creating great live videos TODAY (regardless of your tech skills). Don’t let video become the equivalent of my mother-in-law buying me a screwdriver kit and expecting things to get fixed around the house. Denise Alison helps service-based entrepreneurs increase their visibility, grow their audience, and attract more customers with social media and live video! 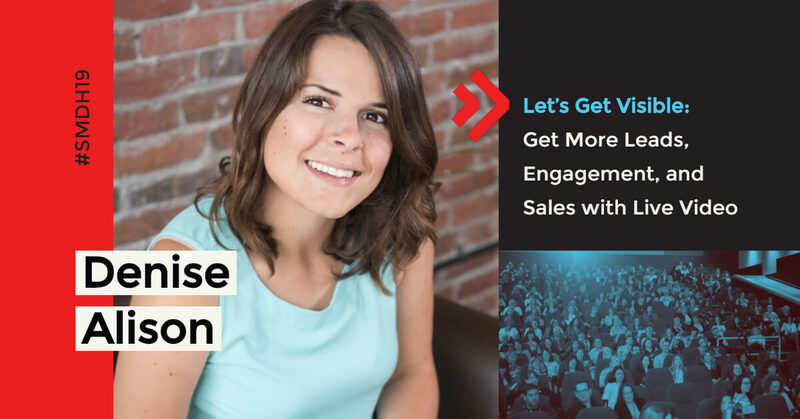 She’s the Founder of Stratigro Social Media Marketing, The Live Video Formula, The Art of Online Marketing Live Show, and The Video Marketing Summit for Entrepreneurs. Denise is based in rural Nova Scotia but has had the pleasure to work with amazing entrepreneurs across North America to help them increase their impact, position, and profits.